Flight Time: 7 hrs. 44 mins. Total Flight Time: 20 hrs 18 min. This morning broke clear and calm. We were ready for an early start but waited for weather reports which indicated favorable conditions for the flight which left at 8:43. As we had taken three hundred twenty five gallons of gasoline in anticipation of proceeding on to Seward instead of stopping in Cordova, the "Boston" and the "Seattle" experienced difficulty in leaving the water, but on the second attempt the flight proceeded. Lieutenant Wade in "Boston" was to lead the flight on this leg of the journey. Our fair weather was of short duration. After passing Point Theodore on Yakovi Island, we encountered violent snow storms until we reached Icy Bay, near Malaspira Glacier. In order to keep his bearings, Lieutenant Wade flew directly over the shore line where the waves breaking on the beach could be seen at an altitude of about 100 feet. The "Seattle" was flying in position of No. 3, the "Boston", which was leading, and was forced to stay within about 50 feet of the leading plane in order to maintain contact. It had been previously arranged that under such circumstances the other planes would maintain a position in echelon off shore. Under such adverse conditions as these, this was impossible although these instructions were followed out until a sudden change of the leading plane had endangered the other planes in flight when the "Chicago" and "New Orleans" fell behind until they could follow the shore line as was being done by the leading plane. In this way, we flew for three hours and thirty minutes, until off Icy Bay when the storm ceased and the atmosphere became clear and the sun bright. At 11:35 a.m., while in the storm, the r.p.m. of the engine on the "Seattle" started dropping. The position of the three-way valve was changed to feed from the gravity tank but there was no improvement. It was observed that the automatic circuit breaker had opened the circuit. The circuit breaker was closed when the r.p.m. returned to normal. This happened when we were but a short distance from the water, the plane almost reaching the water before it was corrected. After the storm ceased we climbed to an altitude of 2000 feet and passing the entrance to Cordova continued to Seward, arriving at 4:20 p.m.
Resurrection Bay is a beautiful stretch of water surrounded by high mountains. The buoys were located about 200 yards off shore near the San Juan Fisheries docks about 3 miles northeast of Seward. 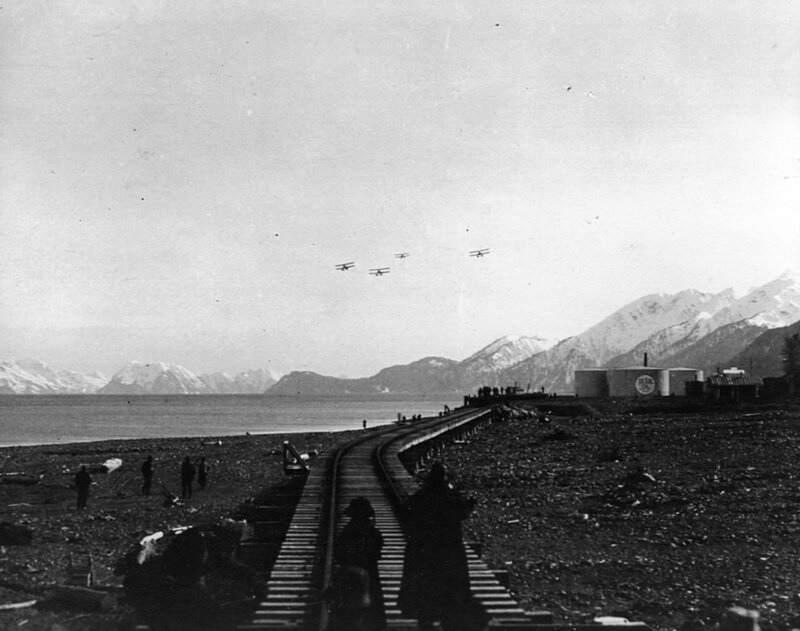 The pilots of the four planes met on the wharf where they were greeted by the Mayor of Seward and other leading citizens. After a conference with Mr. H.B. Ellsworth, the local representative of the flight arranged for the servicing of the planes. This was expedited by having two medium sized dories in which the drums of gasoline were taken to the planes. In serviceing the planes with gasoline, it was pumped by hand operated centrifugal pumps, a part of the equipment of each plane, from the drum to the tanks. The oil, in five gallon cans, was poured by hand into the oil tanks. This work was completed and the planes secured for the night before darkness fell. We were taken to the Hotel Van Gilden where accommodations had been arranged for us by the advance officer of the 1st Division. This morning, the flight took off for Seward, Alaska, with the intention of landing at Cordova, a prepared base, in case of strong head winds or sever weather in that locality prevented a nonstop flight to Seward. The planes followed the coast line until passing Cape Suckling. About 45 miles out from Sitka, snow squalls were encountered, but it was possible to fly around them until reaching Icy Point; then heavy snow, which reduced the visibility to practically nothing, was encountered and continued until reaching Yakutat Post Office where clear weather was reached; after crossing Yakutat Bay, the flight again encountered snow storms until at a point near Cape Suckling. Through these snow storms, the planes were forced to fly along the beach about 10 feet above the breakers, the breakers being the only thing visible to the pilots. After passing Cape Suckling, perfect flying conditions were found. The flight decided to omit Cordova as a landing station and continued to Seward, passing over Montague Island to Cape Resurrection, up Resurrection Bay to Seward. Seward is a land locked bay that furnishes good protection for anchorage under all conditions, excepting during storms approaching from the south. Anchors and ropes were purchased locally and added to the concrete blocks to which the planes were moored. This precaution was taken due to the experience in Sitka, in view of the fact that a storm was approaching. Up today at 5 o'clock and about 6:30 all were at work checking the planes. This took almost two hours and just before 8:30 Wade in #3, today's leader, swung out to the runway followed by the others. Everyone had a little trouble in "getting off" but by 8:45 all were in the air & we swung over Sitka & onto our course. For a couple of hours the weather was ideal & then we started to run into snow squalls, light ones at first, & then heavier & heavier. About 1:30 we struck a regular blizzard that lasted nearly 45 minutes, the thickest weather any of us had ever flown in. The only possible way to keep going was to fly along the beach just over the water & follow the black beach line. Several narrow escapes from collisions took place & everyone breathed a sigh of relief when we finally broke through into brilliant sunshine. From here on the weather was ideal, clear & sunny, and again the snow capped mountains were admired by all. Quite a few glaciers were passed & being the first seen by many of us, they were given a keen looking over. They are nothing more or less than a river of solid snow & ice, yet to me it created quire a feeling of awe. About 3 o'clock we drew up opposite Cordova but everything was so fine, clear weather & engine running smooth, that we went to Seward where we landed at 4:15. Seward is in a land locked bay surrounded by towering mountains, of course covered with snow, and is the terminal for a Government owned railroad. Everyone at once went to work checking & fueling their planes & with the exception of oiling most of the work was completed by dark. I neglected to mention that along the coast we saw at least a score of boats that have been driven ashore, all sizes from small fishing boats to big steel tankers. Smith was very serious as to what makes them all sit up so straight in the sand, none of them were laying down, all seeming to be upright on their keels. I hope we never have to fly through such thick weather again, and more than ever I am convinced that as pilots the boys on this trip are unbeatable by any in the world. During blizzard would suddenly flash over small villages, most of them deserted, remains of gold rush towns afterwards learned.